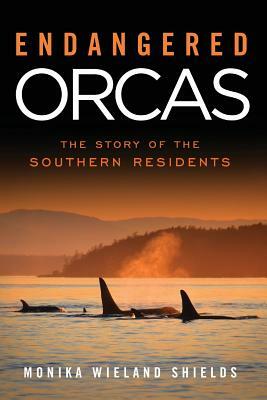 Orca Watcher: The New Word of the Summer: Hodgepod! 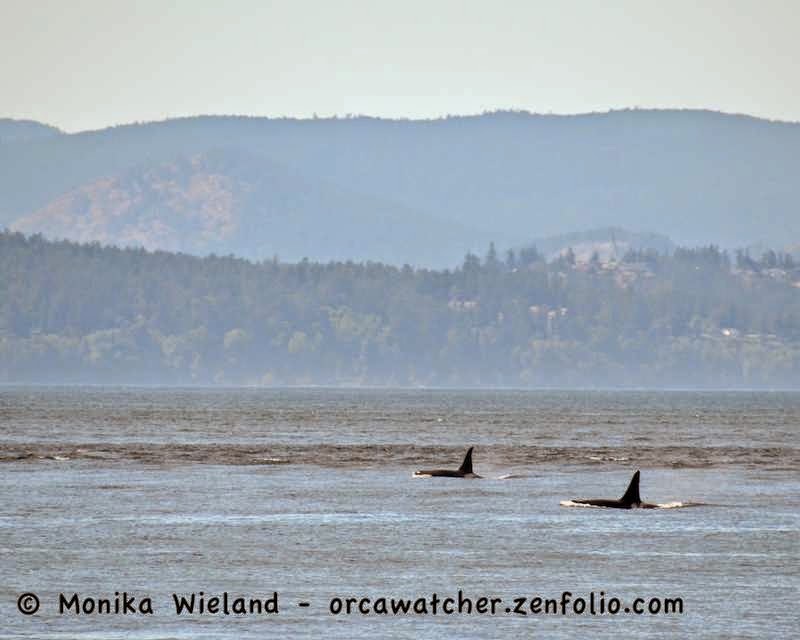 It has been something else this year trying to keep track of who's where when it comes to the whales - they've been mixing and matching into new combinations on a nearly daily basis. 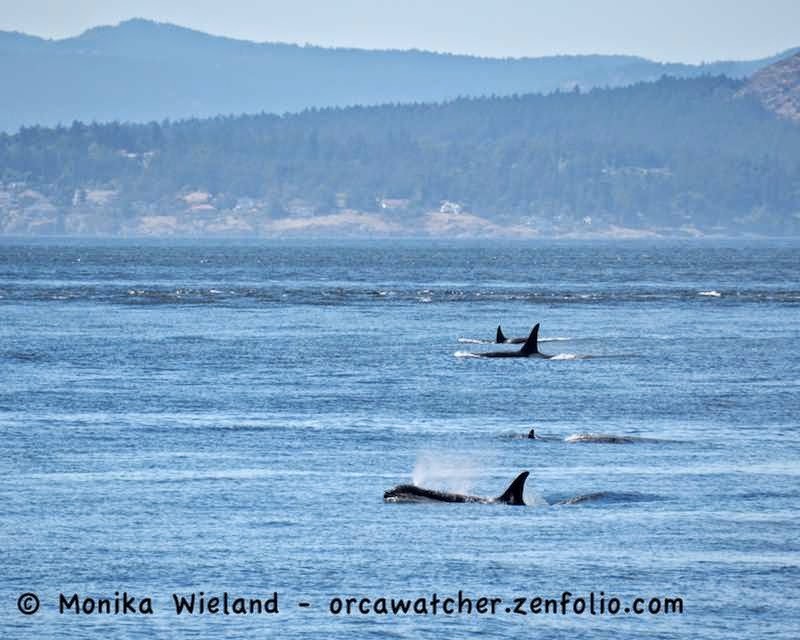 It's taken extensive comparing of notes among whale watchers to try and piece together what's going on, and on any given day there seems to be multiple stories circulating as to who's out there and where they are. It seemed a worthy time to coin a new phrase - we're not seeing that many superpods, we're seeing a bunch of hodgepods! August 19th was one such day. 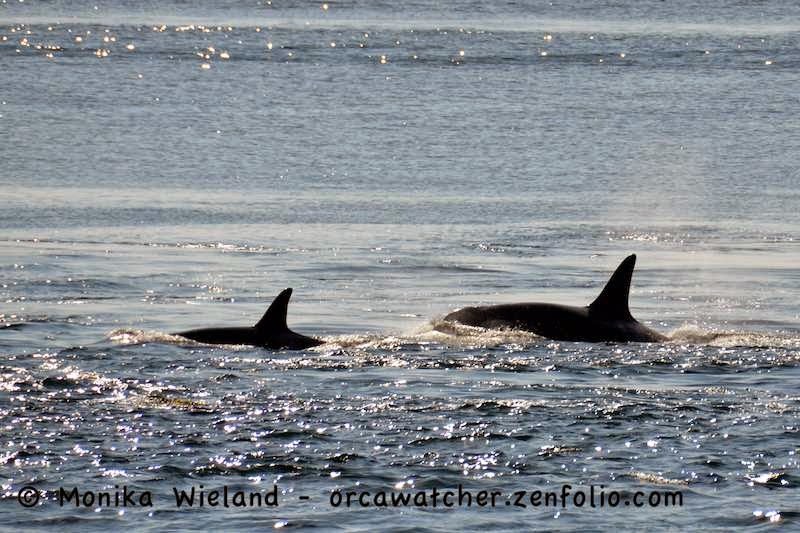 Members of all three pods were around and had headed north in Haro Strait in the morning. 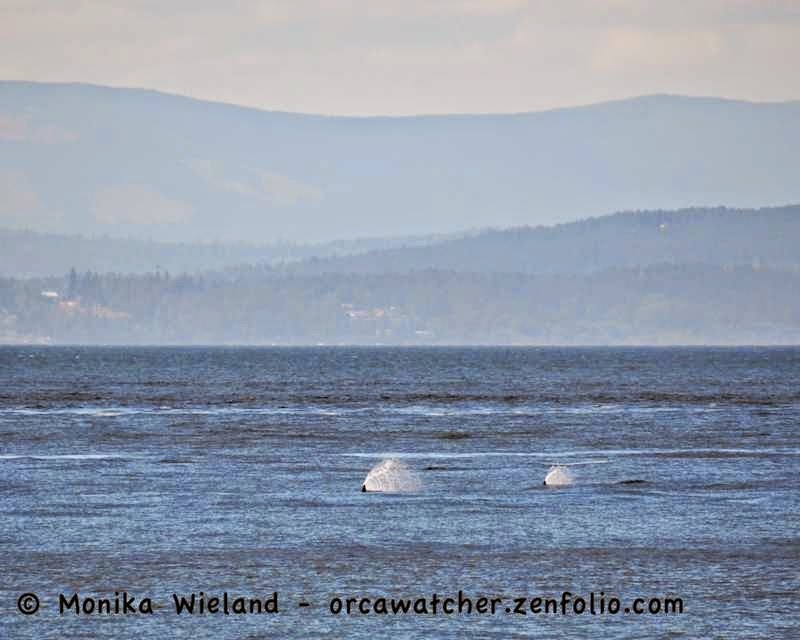 When I got off work I went to Lime Kiln and saw that some whales were coming back south again. Who would it be this time? A big group of L-Pod whales! We call them "L-Pod" like they're some kind of cohesive unit, but the fact of the matter is they split regularly into at least three different groups and rarely travel all together. I'm actually not sure I've ever seen all of L-Pod together without any Js or Ks present - if I have, it's not very often! 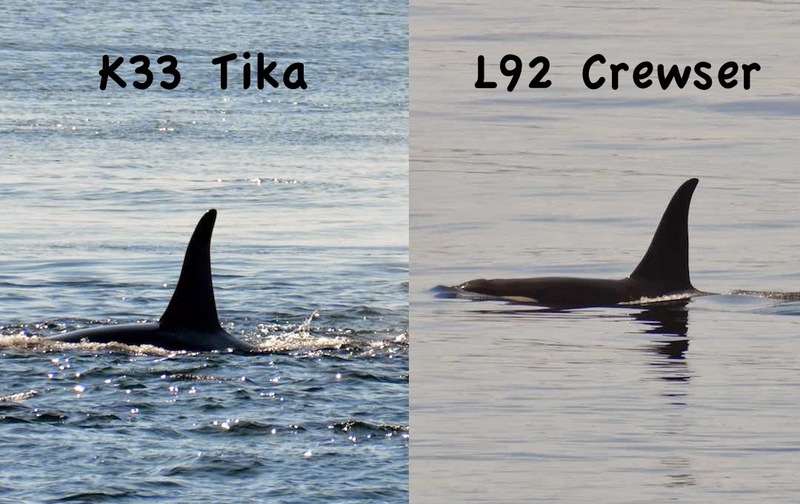 The afternoon of the 19th was the closest I've come this summer: all of L-Pod except the L12 sub-group were there, including the usually elusive L54 sub-group! The whales were pretty far offshore, but it was impressive to see so many of them (about 25) traveling together in one big group. As they swam against the strong flood tide, a big freighter wake came through, and about half a dozen of them surfed it! It was awesome to see just the tip of the dorsal fin protruding above the water as they "sharked", or zipped along right below the surface at top speed. Way offshore seemed to be where the "boy's club" was hanging out. It included L88 Wavewalker (the first time I personally have seen him this year), L84 Nyssa, L92 Crewser, L95 Nigel, and L105 Fluke. On the evening of August 20, word was that Js and Ks were heading south down Boundary Pass and Ls, who had been heading west out the Strait of Juan de Fuca, had turned and were coming back. Suspecting all the whales might meet up early the following morning, I made an early morning of it myself and went out to look for whales. There's something extra magical about being out there whale watching first thing in the morning. There haven't been any sighting reports and there are no boats with the whales, so you're totally on your own to find them. 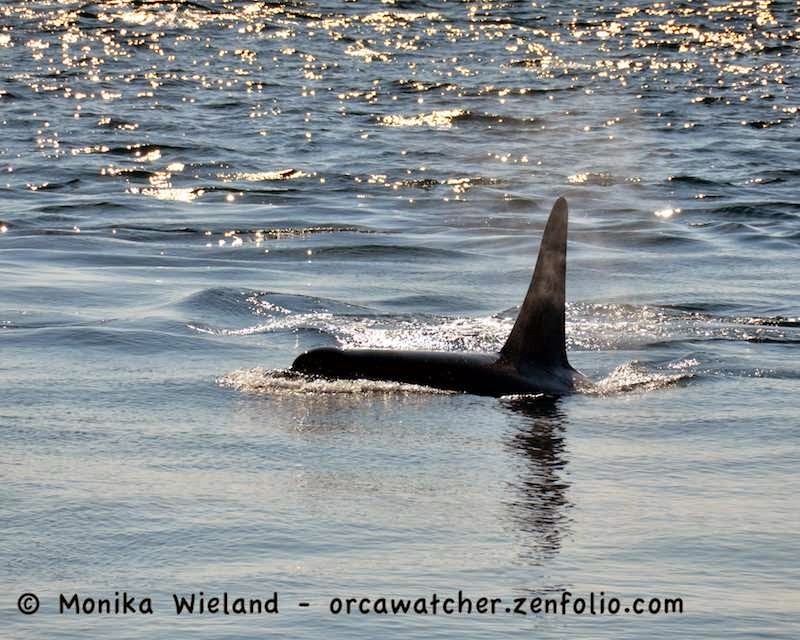 When you spot some dorsal fins slicing through the water, as I did on this morning, your heart definitely skips a beat! 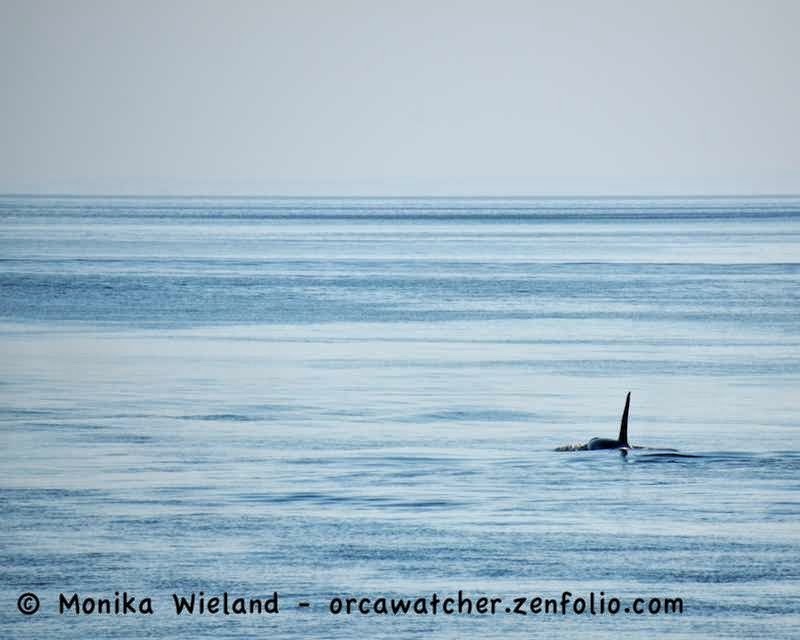 Not only did I "find" the whales on my own, but I had an even rarer experience (in August, our busiest month, no less! ): I was the only person watching them on the rock at Lime Kiln as the first whale approached! Alas, it ended up being the only whale to approach. 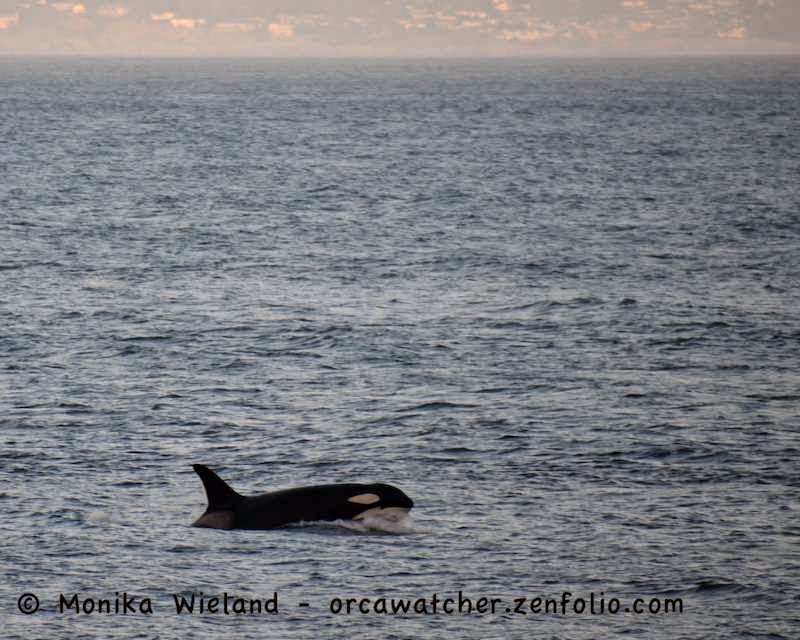 She got just in front of me, then flipped and went back south, as both she and all the whales behind her turned around. In true hodgepod fashion, I had no idea who I was looking at. Had Ls made it in the night before, or did some or all of the Js and Ks come down from the north? Turns out, it was K13 Skagit. The K12s, K13s, and K14s (no K16s or K21) did the west side shuffle all day, and when I got out from work my timing was perfect to see them approaching Land Bank heading south. 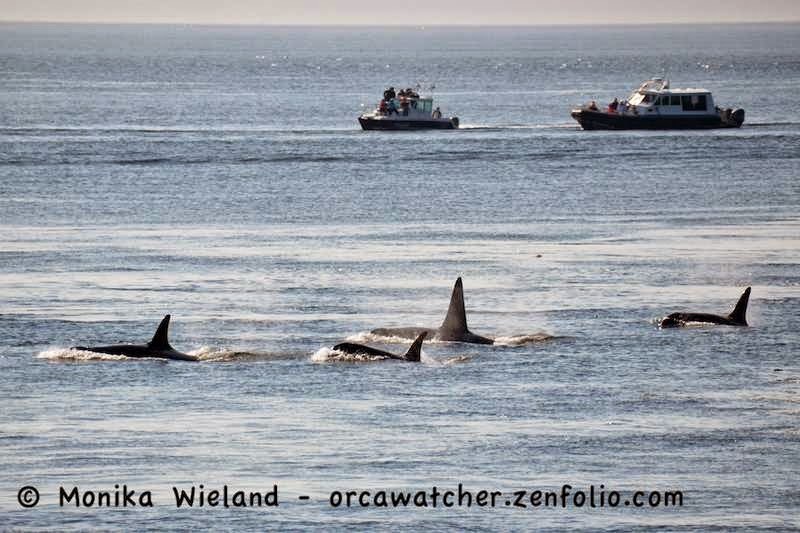 I pieced together the picture later with the help of a few friends, but at the time, I still wasn't sure if some L-Pod whales were present or not. K33 Tika was not helping the matter. He has been my "nemesis" whale this year; he's grown a lot, but also seems like a shape shifter, so I've been misidentifying him all the time. As he swam by on this afternoon, totally backlit of course, I mistook him on one surfacing for L92 Crewser and another for L95 Nigel. 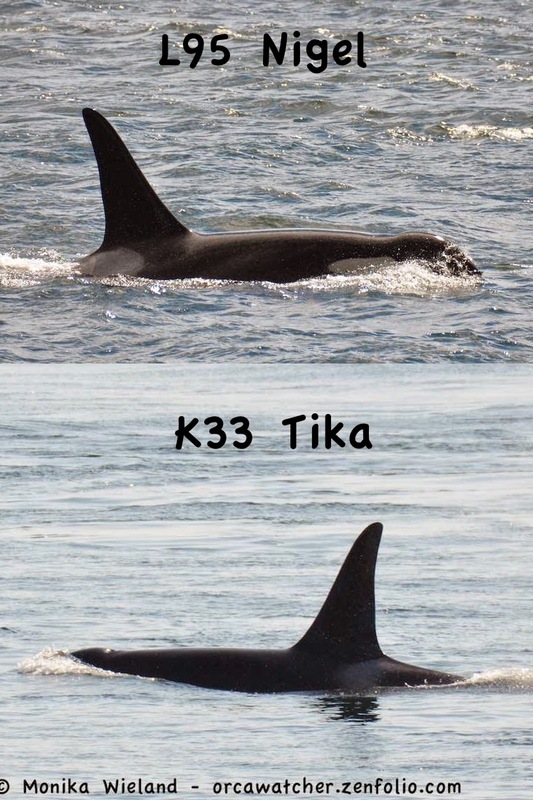 Lest you think I'm making things up, check out these photos - both of Tika were taken yesterday, and the shots of L92 and L95 were taken earlier this summer. He's a shape shifter, I tell you! As the Ks continued heading south in the glassy waters, a purse seiner passed them. It's always interesting to see the juxtaposition between the two salmon fishermen: one human, one cetacean. 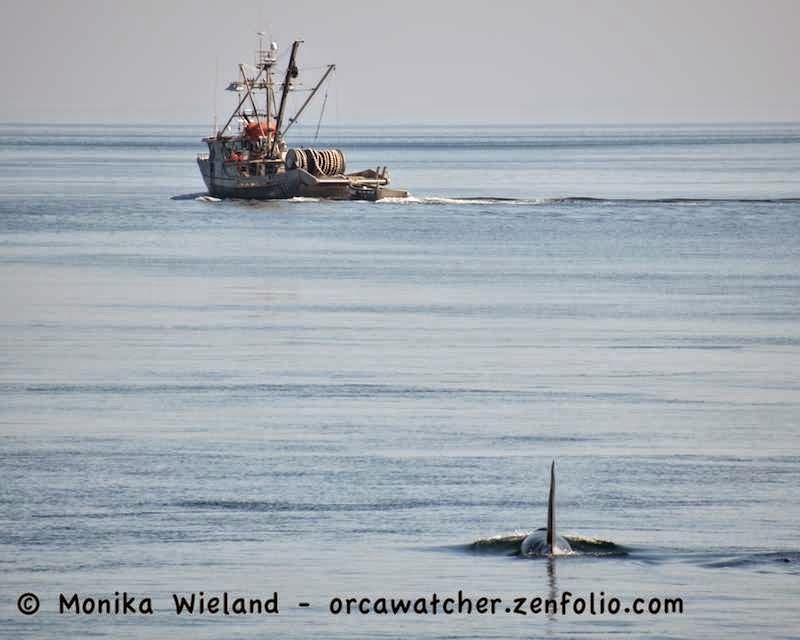 After the seiner passed, for a few minutes I could snap photos of just whales and water. I like these kind of shots, even when they're far away - it sort of gives a sense of space, a sense of just how far these wild whales roam on a daily basis. As every day draws to a close, I find myself wondering, what will tomorrow bring? Of course it's always true that we don't know what the next day holds, but with all these unusual groupings of whales, it seems more true than ever! I love the new word of "hodgepodge". Very appropriate. I still enjoy your blogs a lot, especially the photos. Keep them coming!